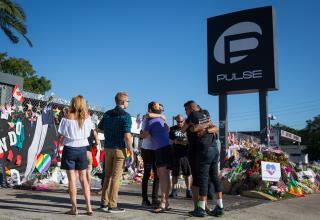 (Newser) – Orlando police said Thursday that someone broke into the Pulse nightclub Wednesday night, hours after law enforcement had turned control of the club back over to its owners, the AP reports. The club had been under police custody as part of the investigation into the June 12 shooting that left 49 victims dead and injured 53. A police report listed no motive or suspects, and ABC News notes that whoever broke in pulled plywood off of an entranceway to gain access. An alarm system complete with interior cameras was not turned on Wednesday night. The Florida Department of Law Enforcement and Orlando police had just ended their control of the property Wednesday, though the investigation into the worst mass shooting in modern US history is continuing. Hmmmmm. Nothing was damaged or was taken???? Sounds more like a publicity ploy by the owners to get back in the news to increase business. What next an all you can eat promotion?